The Dominators kidnap several heroes and place them in a shared hallucination of a different life--a life where Oliver never got on his father's boat. Barry, Felicity, and Kara, along with their friends, try to rescue them. This episode marked the 100th episode of Arrow, which is an exciting feat. Thrusting Oliver and the other characters that have been in Arrow into a hallucination of another life was a perfect way to capture the previous episodes and pay homage to such a series. Not only did old cast members return, but there were a lot of moments and flashbacks that reminded us where Oliver and the Green Arrow all began. I'm still angry about Laurel's death from last season, so I was excited to see her return for Arrow's 100th. 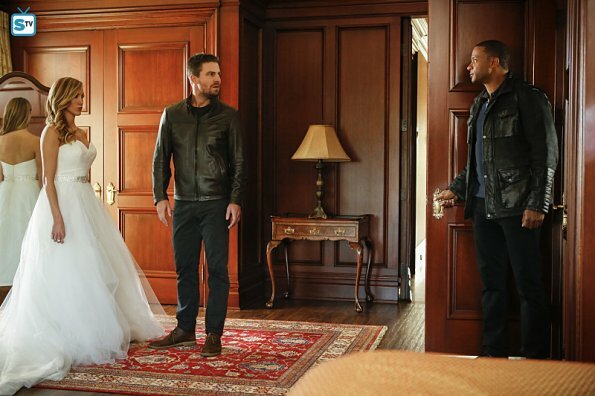 It was even more special because in the hallucination world, she and Ollie are about to get married! (Does this mean Oliver and Laurel are officially canon?) It broke my heart for Oliver to leave her behind because I know he and Sara desperately miss her. My favorite moment was when Laurel and Sara were together; I love their sister relationship, and I'm sad that the show hasn't been able to keep that since she died. It was fabulous to see the whole Queen family together again--even Oliver's father, who didn't have a lot of screen time. (Fun fact: He is played by the same actor as season one!) But of course, that also made it heartbreaking for Oliver to say goodbye to them... again. (So much angst in one episode. Who knew?) The worst was that Thea didn't want to leave. I was worried that she would stay, and we would be saying goodbye to her on the show. Ray Palmer was also taken by the aliens, so he had to fit into Oliver's "new" life somehow; I thought it was fitting that he was a potential buyout for Queen Consolidated, which gave Oliver a few choices of his own in this new life. Felicity, also, was his fiancée, which was sort of fitting considering their past. Overall, Ray Palmer is a cupcake no matter what "life" he is in. It was fun to see a lot of moments that reflected back on past episodes of Arrow, especially past enemies. Deathstroke, Damien Darhk, Malcolm Merlyn, and HIVE were all present in some manner during this episode. Each of the kidnapped heroes had to fight one of them, and the pairings were spot on. Oliver fought Deathstroke, who is his greatest foe. Sara fought Darhk, who she still holds a grudge against for killing Laurel. Thea fought Malcolm, who she loathes. Diggle fought HIVE, who stole his brother away from him. And Ray fought a Mirakuru solider, which was fitting since one of them killed his fiancée. The end of Oliver's hallucination truly showed how far Oliver has come in being a hero. Past family members and members of Team Arrow shown as hologram projections saying something about Oliver over the years. (Tommy!! They also made reference to the show the actor is currently on: Chicago Med.) It showed everybody Oliver was leaving behind by choosing the true life and not the hallucination, but it also revealed everybody that Oliver, in some way, affected. It was perfect for the 100th episode, and I'm not crying, you're crying. Team Arrow was finally part of this crossover. And it was fun. Curtis freaking out about the aliens and also being BFFs with Cisco over technology was my favorite part. Of course, I enjoyed Rory's contribution to the team, as always. Wild Dog was still a punk, and while he learned that metas can be trustworthy, he did irritate me for being so mean to all the metas. Where was Evelyn though? She missed out. It's always a joy to see Cisco interacting with other folk, especially Felicity and Curtis. He was very confident and fun this episode, unlike the previous one. I loved his reference to Star Trek. I was wondering when the Legends of Tomorrow (other than Ray and Sara) would show up in this crossover. Nate had perfect timing to collect the kidnapped heroes. And he helped them figure out why they were chosen--because they aren't metas. Whatever the Dominators are planning, it has something to do with meta-humans. Barry and Kara teaming up to take out the eye patch chick was so fun. I love them together. I want more Flash/Supergirl team-ups, please! Okay, but who would have thought there would be an epic space battle on Arrow?! I'm freaking out! It was so cool. I loved every moment of it. It was fun and perfect and just wow. Look at those special effects. I'm satisfied. Not much. It wasn't so much I didn't like it, it's that I didn't understand it. Who was the chick with the eye patch stealing stuff? What does she have to do with anything? It was just weird and kind of thrown in there. Other than that, this episode was solid. A lot happened, but it was so worth it. Overall, this episode did wonderful for Arrow's 100th. It had the perfect blend of awesome team-up moments for the crossover and nostalgic moments for the past five years of Arrow. Writers, you did awesome. Now... to defeat the Dominators! What did you think of "Invasion!"? Do you think this episode did a good job to mark Arrow's 100th episode?